binoculars trained on sheets of snow. In our journey to Canada this summer we found a volume of poetry — White of the Lesser Angels — by the Canadian writer Janice Kulyk Keefer. 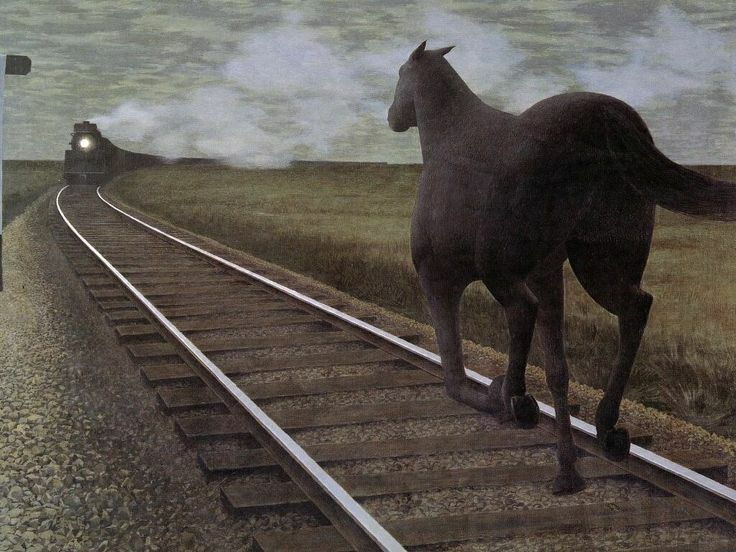 The poem that resonated the most was the one entitled Alex Colville. Born this day in 1920, Alex Colville was one of Canada's most celebrated artists. Prints of his haunting painting, Horse and Train adorned the walls of various residences, through my various lives for more than 20 years. I am still moved by the painting as I am now moved by Keefer's poem. The back cover of White of the Lesser Angels (Ragweed Press, 1986) reads in part, "With this collection of poetry, Janice Kulyk Keefer joins the ranks of those Canadian writers who achieve distinction in writing both poetry and fiction. Her poetry is a feast of sensuous imagery, intelligence, finesse and acute insight into private and public affairs."